A light nourishing antioxidant cream with world famous Goji berries. Goji berries appeared on our market a few years ago, instantly climbed to the top of its popularity. Native to Southeast Asia, these red elongated berries have rich nutritional composition, where the main roles – the vitamin C, a powerful antioxidant. It's function in cosmetics is extremely high: the ability to improve elasticity and fight wrinkles, and the alignment of tones with the "smoothing" of pigmentation, correction of terrain, removing scars, removing acne, inflammation, pimples, a greasy Shine, water balance and metabolism. 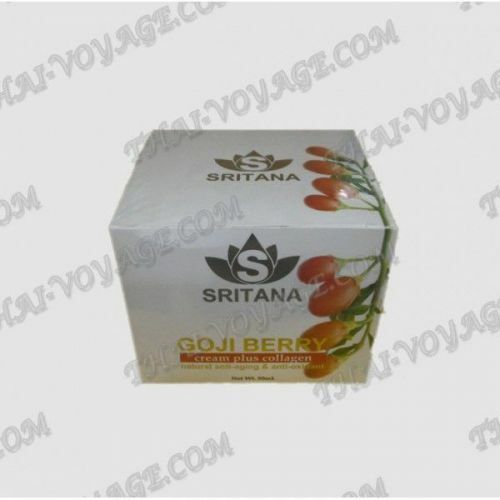 Extract of Goji berries helps to turn back time, to achieve smoothness, freshness and tenderness, to gain a healthy glow, maintaining the achieved results. Coconut oil contains a number of fatty acids, many vitamins and essential nutrients, moisturizes, nourishes and softens the skin, helps to resist the adverse external factors, to preserve the beauty and grooming at any age. Shea butter, known for its mild action, is very popular among manufacturers of children's cosmetics, it makes the skin soft, relieves irritation, peeling and dryness, giving absolute comfort. The fish collagen that is the closest to human, is well absorbed, normalizes the water balance in the epidermis, it also stimulates the body to produce its own similar substance. Light cream in a beautiful jar will delight every beauty, turning the treatment into fun, You will enhance its effectiveness. Application: the cream is designed for daily use. Twice a day apply a small amount onto face, avoiding the eye contour area.